If you are the kind of soul who prefers the good old golden glow of the hearth to be your ally on cold winter days, and you let yourself to be allured by the crackling sound of the wood and the smell of the smoke, and the warmth of the embers over a cup of coffee or a glass of wine, wood-burning fireplaces are definitely your thing. Wood burning stoves needs bulks of logs for burning and needs a chimney to let out the smoke. Unlike other fireplaces, this stoves heat up the place more directly, and has more heat output comparatively. There is a huge demand for wood burning stoves in the market today and a good number of varieties are available varying in design, technology, size, material etc. More than a fireplace it has now become a fine piece of décor adding to the ambience of any room that is placed. So when it comes to buying the right one, the job can be a bit difficult. So before you light up the first fire of the season or buying a new wood stove, there are a whole lot of things about wood burning fireplaces you should know. Let us start with the very question that has popped up in your head right now? 1 Is Wood Burning Harmful to the Environment? 3 How to Find the Best Wood-Burning Fireplaces? 3.3 Factor 3: Which Combustion Technology to Opt for? 3.5 Factor 5: What is the Ideal Log Length? 3.6 Factor 6 : How to Select the Size of Fireplace? 3.7 Factor 7: Material- Cast Iron or Welded Steel? 5 How to Find out Your Heating Requirements? 6 How to Keep Your Fireplace Well Maintained? 8 Did You Find the Best Wood-burning Fireplace for Your Home? Is Wood Burning Harmful to the Environment? Unfortunately, yes it is. The smoke burning wood creates contains a complex mixture of gases and particles leading to particle pollution which may cause health problems. In addition to this air pollution is also caused by benzene, formaldehyde, acrolein and polycyclic aromatic hydrocarbons (PAHs). The improper use of the appliance may affect the quality of the air inside. If the wood is not burned completely, the smoke may contain a number of particles including Carbon Monoxide (CO). Studies indicates that more than 150 people die from CO poisoning caused by the improper use of home appliances every year. Installing a CO dictator and smoke alarm, using well seasoned woods, maintenance of your fireplace from time to time are a few ways to ensure the your safety as well as a safe environment. The secret to a green (or greener) fireplace is in how best you keep the hearth and chimney clean and safe, how responsibly you burn. What’s the best thing you can do here is to buy a EPA certified fireplaces fireplace. We have explained at length about EPA Certification below. Complete burning of wood is ensured by EPA certification, thus minimizing the damage done to environment. The tedious task of taking care of conventional wood fire and the mess after is now an easier task because of the technological advancement.The gaining popularity of wood burning fireplaces is a proof that people finds wood stoves convenient and beneficial. As compared to other heating appliances like gas or electric fireplaces, wood stoves are more efficient in heating up the place directly and give a higher level of heat output. You wouldn’t have to endure another cold night if the electricity runs out or the boiler is broke. All you need is, some wood neatly packed in the log rack, ready to use, ready to use. There is a huge choice in design, heat output, size, compact etc. to suit the varying needs of the customers who prefers wood burning furnaces. The total ambience of a wood fireplace; the dancing flames, the golden glow, the crackling sound of timbers, the subtle scent of the smoke, cannot be replaced by any other fireplaces. Moreover, it would make an amazing display to any interior. 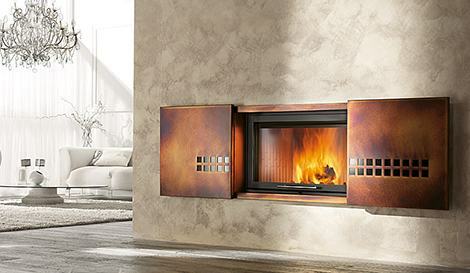 It is no lie that the aesthetic appeal alone makes people prefer wood burning fireplaces over modern heating methods. How to Find the Best Wood-Burning Fireplaces? Do not let those many products and consumer options available in the market to leave you in a dilemma. Going for the most sought after or the most expensive one wouldn’t be a good idea. The price doesn’t always reflect the quality of the product as you can assume it. The best wood-burning fireplaces for you is the one that suits your home and chimney the best. Here are certain things that will help you figure out what makes a fireplace good enough. Make sure you consider the following features of wood fire furnaces before you make up your mind. The first thing to check when you are in store to buy a wood stove is whether it is certified by the Environmental Protection Agency. The EPA certified fireplaces are emission tested and meets a set of requirements set forth by EPA. The certified stoves will burn more cleanly and efficiently than the uncertified ones. These stoves burn more completely using the provided wood. That is you get maximum heat out of the wood and less smoke. The emission of air-borne particle will be less ensuring a safe atmosphere. Also there will be less creosote which is a byproduct of burning wood that can build up in the chimney and cause a fire. However, the efficiency level of EPA stoves also depends on the wood used for burning. The use of substandard woods may affect the performance and the heat output. It’s important to make sure the quality of the wood being used. It will save you time, money, fuel and resources. Most wood stove has their heat capacity marked in British Thermal Units (BTU). By definition it is the overall capacity to heat a space. That is, the BTU of a specific stove denotes its heat output per hour. The BTU rate of all the popular stoves falls in between 24,000 to 80,000 range. The larger the BTU, the more capability it has to heat large spaces. An average medium sized house needs only 5,000 to 20,000 per hour in the case of continuous burning. Using the full output of a stove for a long period can damage the stove’s innards. Factor 3: Which Combustion Technology to Opt for? There are two combustion technologies available; catalytic and non-catalytic combustion. Catalytic combustion can produce a long and steady heat output. At the operational level stoves using catalytic combustion are a little complicated. These stoves /need proper maintenance and with careful use it can last more than six years. Non-catalyst combustion is preferred because of the high heat output and the beautiful fire they hold. The internal parts of the ‘non-cats’ needs replacement from time to time as they deteriorate with heat easily. To pick the better one is a bit difficult; both proved to be equally effective and will burn up about 90% cleaner when compared to traditional conventional stoves. However the market trends are slightly in favor of non-catalyst stoves. Most manufactures care to specify their burn time as per the EPA test. Burn time refers to the length of time a specific stove can burn with one full load of logs. Longer burn time ensures quality fire and saves you the time you need to find to keep up the fire or refill the firebox. However the burn time largely depends on the quality of the wood use for burning. It is advised to use ‘seasoned wood’ that has been cut and dried before 6-12 months. The seasoned wood will have very least moisture content that will help in clean burning. Using green wood will lead to spoiling the fireplace, chimney, atmosphere and your lungs as well. The split logs burns more efficiently than whole logs. Factor 5: What is the Ideal Log Length? The length of the log that can be used for burning depends on the size of the firebox, and varies from one stove to another. Generally the long length of a particular stove will be mentioned by the manufacturer. The standard length for firewood is 16 inches, which is practical for handling. However there are stove that offers up to 22 inches. The larger log lengths are convenient as it spares you from splitting the logs over and again. Factor 6 : How to Select the Size of Fireplace? The size of the fireplace must be choose in accordance with house type, the size of the house, climate zone and standard fuel. It is important to choose the apt size because the heating capacity, burn time etc varies with the size of the stove. The major size in which wood burning stove comes are small, medium and large. Small stoves have fireboxes with volume less than 2 cubic feet and would be proper for large rooms. Medium ones comes with a firebox volume between 2 and 3 cubic feet and are proper for small-to-medium sized houses. Large stoves have firebox volume greater than 3 cubic feet and are suitable for heating a large area or leakier houses. It would be wise to seek the advice of an experienced stove dealer of your area, always. Factor 7: Material- Cast Iron or Welded Steel? Cast iron and welded steel are the two important material options available. Since the heating performance is same with those two materials, the decision should be made depending on the convenience and the cost. Cast iron fireplaces are mostly a work of art. It would fit in the home like a fine piece of furniture and would the job of heating up your place. It is of premium price and needs to be rebuilt every few years to seal the joints between the panels. If not rebuilt, there are chances for air leakage which will cause the fire to burn out of control. Welded steel stoves are comparatively of low cost. And it is plainer. Steel stove makers leave you with the option that their highly stressed internal parts are replaceable. The price of the stove varies considerably from one stove to another. So its installation and running costs. Installation costs add to the initial expenses significantly. If you don’t opt for a stove that go with your chimney, getting the chimney right for the stove can cost just as much as the money you pay for the stove, if not more than it. Most of the stove comes with a warranty of limited lifetime and at the least 5 years. Most companies guarantee to replace the parts that are prone to damage within the warranty period. So check out which and which parts comes with the warranty. Running cost can be tricky to calculate. Stove needs wood for burning. And as you know, wood is a bulky fuel and the cost involves transportation from store to your place other than the price. It is best to buy in bulk and store for a period of time. These are a few things to consider when buying a wood fireplace. Other features like whether the stove includes an ash pan, cooking surface, what kind of blower system and air inlets it features, and aesthetic matters like design, color, door frame, glass windows etc. are to be considered if you are looking for stove that meets not just your heating needs but also the total ambience of your home. How to Find out Your Heating Requirements? The stove that proves to best in efficiency or heating performance, or the one that offers the longest burn time definitely will be a good stove. But on the other hand, it will not the best, or even the right, stove for you. A stove that doesn’t match your heating requirements can either under heat or burn down your place, let alone the loss of money it can cause you. So how do you find your heating requirements? Most heating products come with their heat output and optimal area noted. You only need to see which one matches the best to the size of the space you need to heat. Burning your stove at full blast constantly will cut down its performance in the long run. And yeah, unless the cold is hard and calls for it, you will not be burning the stove at its maximum all the time. So it is a good idea that you add 25% extra to total area and then look for the matching stove. How to Keep Your Fireplace Well Maintained? Install Smoke detector and Carbon monoxide alarm. Safety first! Keep the ash tray clean every once in awhile. Burn seasoned woods for a clean and hotter burn. Avoid soft woods and moist logs that can cause pollution. Avoid burning at the stove’s maximum capacity constantly. Don’t use slow burning woods. It expels more smoke. Make sure the opening to the firebox is closed safely after fire is lit. Have your fireplace inspected once in a year by a certified sweep. Keep the glass windows clean and clear for a better view of the firebox. Never ever burn trash or any other material other than logs inside the fireplace. Have your log rack topped up from time to time. Make sure you never run out of wood and get stuck in cold. Do not keep the necessary repairs and replacements of fireplace pending. Keep the chimney clean of creosote and other build ups. After considering the variables like price, functioning, efficiency, heating performance, durability, customer feedback etc., of various wood burning furnaces that are in demand in the market, these are the five wood stove that tops the list of best wood stoves available. 78% Efficiency –The stove has been rated 78% at efficiency level by EPA, which makes it one among the top high efficiency wood stoves. 4 Cu. Ft. Firebox-The firebox size of Drolet HT200 is 3.4 cubic ft. which can hold a good pack of logs which are up to 22 inches long. Ash Drawer – The ash drawer beneath its chamber makes cleaning up your fireplace an easy job. Quality Build- The durable steel construction of Bond 66594 makes it extremely durable and suitable for outside use. Poker, Log Rack and Cover- This wood stove provides poker, log rack and cover as it is specially designed to suit the outdoor use. Mesh Screen Doors-Most wood fireplaces sports ceramic glass windows. But Bond 66594 features mesh doors as it is an outdoor fireplace. Timberwolf Ecnomizer is admired for its amazing looks and sleek touch and unbeatable heating performance. It is one stove that works with majority of the chimney types and easy to install. It do not take up much space and fits nearly to the wall. Considering other wood stoves that fall in the same price range, Timberwolf Ecnomizer is sublime. 86% Efficiency- The fairly high efficiency makes it cost effective and worth every penny you spent for it. 9 Cubic Feet Firebox- large capacity of the fire box makes it possible to burn logs as long as 18 inches. 8 hour Burn Time- The 8 hour burn time with one stack of firewood is more than good enough. Designed to suit small to medium houses Vogelzang TR001 is economical in aspects of buying, operating and maintaining. It comes in welded steel material and offers burn time up to 12 hours which makes reliable all the more. 75% Efficiency – High efficiency makes it possible for the stove heats up 12,00 square feet with ease in a couple of minutes as soon as the fire is lighted. 17 inch Log length- Vogelzang has the kind of firebox that is spacious enough to hold logs as long as 17 inches. Excellent Air Inlet – Technically well designed air inlets ensures a quality fire and maximum heat output. Napoleon Ep13Cis EPA certified, cast iron, high efficiency appliance. It offers unbeatable performance and maximum heat output lasting 8 good hours. Moreover its design and looks makes it an all-time favorite of the users. 8 cubic feet Firebox – The size of the firebox Napoleon features is large enough to hold a good pack of 18 inch logs and keep it burning for several hours without fail. Air Tubes – Napoleon EPI3C features 3 air tubes that helps in speeding up the burning process by supplying sufficient air for the burning. Design- This wood stove is cast iron in material. It has a contemporary flush front. The fireplace is available in painted metallic black finish. It also features a handsome glass window. Did You Find the Best Wood-burning Fireplace for Your Home? In short, buying a wood stove involves much thinking. First of all, you have to be certain about your heating requirements like how much heat you need, how much space you need to be heated and if the wood stove is only a secondary heater etc. as well as what type of chimney you have, how large is your home etc and then opt for the best stove suiting your needs. The stove that can meet your requirements and aesthetic sense are not very hard to find. Such a stove, more than being economical and cost-effective can potentially save you on wood, energy, money and time as time pass by. Keeping the stove well-maintained is as important as choosing the right stove. Cracks, leaks, warping, baffle gaps and creosotes are unavoidable to a certain limit and can cause fire hazards. Regularly cleaning the ash out of your fireplace may take bit effort but to maintain proper airflow, it is required. Installing smoke and carbon monoxide detectors can give you alarms in case of danger. It is important that the wood stoves and chimney are inspected by a chimney sweep or an experienced stove dealer at least once a year. Proper upkeep your stove will ensure you clean and safe burning and will change the whole experience of drastic cold season. Be ready to sit back and be cozy this winter and the winters to come by investing on your stove wisely.